Brenna Fitzgerald and Peter Anderson rehearse Company One’s production of Annie Baker’s “The Flick” at The Modern Theatre. 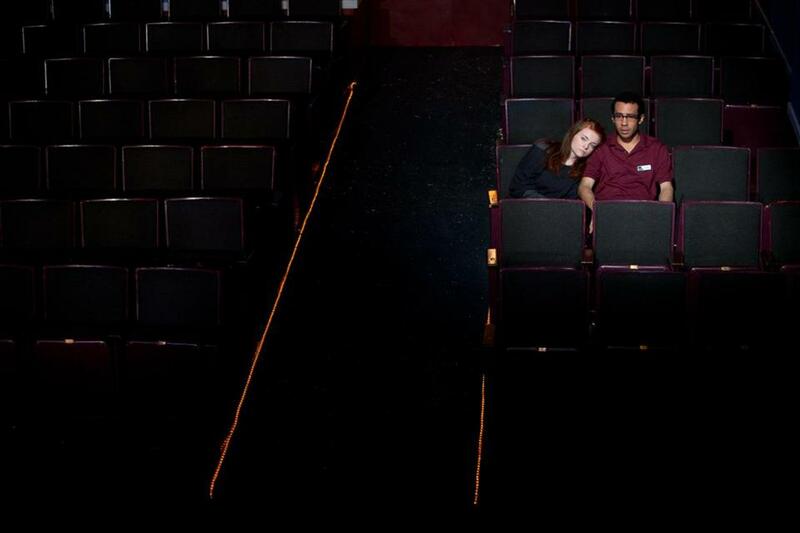 Annie Baker’s “The Flick” may be set inside an empty movie house. But the misfit characters in her play, who toil at this semi-rundown single-screen theater near Worcester that still uses celluloid projection, are a far cry from your typical big-screen heroes and villains. Indeed, they’re the kind of lost, lonely, inarticulate souls who’d fade into the background as cashiers or hotel desk clerks in your average Hollywood action flick or rom-com. The play went on to pocket an Obie Award and earned Baker the prestigious Susan Smith Blackburn Prize, which honors female playwrights. Now Company One Theatre is producing the New England premiere of “The Flick” in collaboration with Suffolk University, at the Modern Theatre through March 15. Baker, who was born in Cambridge, raised in Amherst, and now lives in New York, has become one of the freshest voices in the American theater. She burst onto the scene in 2009-10 with a double-blast of “The Aliens” and “Circle Mirror Transformation,” which went on to share the Obie for best new American plays. “The Flick” features the same leisurely pace and prolonged silences that have become hallmarks of her work, but which have also tested the patience of some audiences or been dismissed as gimmicks. “The Aliens,” which Baker specified should be about one-third silent, contains an extended monologue where a character utters the word “ladder” over and over. Baker’s plays are naturalistic. The dialogue comes in fits and starts, often as idle chitchat, and there is little in the way of traditional action to speak of. Yet there is much going on under the surface. Indeed, in between this mundane action arises a whole ocean of human emotion and drama — secret yearnings, quiet heartbreaks, loneliness and resentment, disappointment and betrayal. As the play unfolds, the characters struggle with personal and moral conflicts, not to mention an unhealthy dose of self-delusion. A veteran usher, Sam takes newbie Avery under his wing. Avery’s a student at nearby Clark University, a quintessential nerd and avid movie buff who works at the theater because it’s one of the last in the area still using a 35mm projector. Sam and Avery discuss their favorite films, and Avery laments the scourge of digital projection. Meanwhile, Sam has a crush on Rose, the projectionist with unruly dyed green hair and a slouchy black wardrobe. When Rose offers to teach Avery how to use the projector, Sam becomes irritated at her insensitivity, revealing to Avery that he’s asked Rose many times to do the same thing for him. When Rose attempts a clumsily overt seduction of Avery, the intimate moment is as uncomfortable and funny as it is deeply human. Still, with its slow pace, prolonged interludes of silence, and three-hour running time, “The Flick” polarized theatergoers in New York. When it premiered at Playwrights Horizons last year, it was reported that some audience members had walked out of the play, with some threatening to cancel their subscriptions. The outcry provoked the artistic director of the theater, Tim Sanford, to take the unusual step of e-mailing 3,000 of his subscribers a letter explaining and standing by his decision to produce the play. 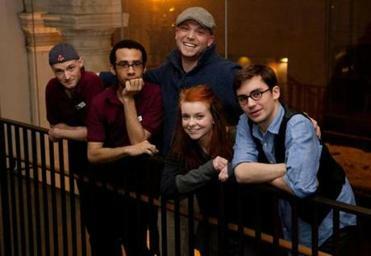 From left: Actors Alex Pollock, Peter Anderson, Brenna Fitzgerald, and Steven Chueka, with director Shawn LaCount behind them at the Modern Theatre. Pollock praises Baker’s “musical ear,” her ability to compose a play like a piece of music, and he doesn’t see much fat that could have been cut. Gold marvels at the “deceptively smart structure” of Baker’s work. Company One has staged “a lot of infuriating plays,” LaCount says with a laugh, but it’s never been afraid to provoke or even anger audiences in its efforts to break away from the conventional notions of theater.